E-Z TILT TEST-TUBS. Individual ration security for group-housed animals, prevents undocumented secondary feed losses from stealing, exchanging of feed, and contamination. Primary access to rations in this installation is controlled by the Calan Broadbent Feeding System. Research animals housed in common pens get only their prescribed ration in the amount dispensed. E-Z Tilt Test-Tubs fill by hand or machine and tip for easy clean-out. These Test-Tubs securely contain individual rations for loose-housed beef and dairy cattle. When combined with the Calan Broadbent Feeding System, total individual feeding control is achieved. E-Z Tilt Test-Tubs' unique tilting features ease the job of manually recovering left-over feed for weighing. For researchers who have mechanized weigh-back procedures with the Calan Data Ranger, the tilting feature provides a convenient back-up if the machine is unavailable. E-Z Tilt Test-Tubs work with the Calan Broadbent Feeding System to secure rations against stealing, spilling or contamination. They abut the feed barrier; feed doors open into the Test-Tub. High-walled sides eliminate problems of feed exchanging or stealing between neighboring animals. Top hood and optional bin flap prevent an animal from spilling rations into the feed alley. The entire Test-Tub tilts toward the feed alley for manual recovery of leftover feed or for thorough cleaning. E-Z Tilt Test-Tubs come in two sizes-one for beef, one for dairy. The lower feed bin holds a full day's ration for the appropriate animal. Heavy-duty reinforced fiberglass withstands high-pressure washing and other sanitizing procedures. Feed bin opening height and shape permits filling by manual or mechanical means. Test-Tub sections stack neatly inside each otherï¿½hoods in hoods, bins in binsï¿½for economical, shipping and storage. Hood and bin sections bolt together easily and mount on a steel rail. Complete installation plans and instructions are provided. All necessary hardware is supplied, except the steel rail, which is purchased locally. MOBILE TEST-TUBS - Individual ration security for confined dairy cows. Feed stays in the Test-Tub. Other animals stay out. The ration is available exclusively to the designated animal. 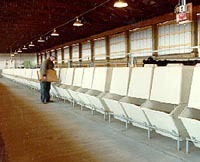 The Calan Mobile Test-Tubs individually feed dairy cattle housed in conventional, tie-stall, or stanchion facilities. The Test-Tub design and operating modes or feeding, withdrawal, transport- provide a complete ration feeding and containment system for confined dairy cows. The Mobile Test-Tubs also give researchers needed flexibility when regulating feeding periods, moving animals or conducting physical examinations. The Test-Tubs do not require supplementary equipment to control or secure individual rations. Permanently attached onto a heavy-duty, four wheeled steel frame, the Mobile Test-Tub can be pushed freely throughout the facility. Or it can be positioned securely before a stall. A special bracket built into the frame fastens the Test-Tub to a short steel track. The track is bolted to the feed alley floor at right angles to the stall curb. When slid on the track toward the stall, the Test-Tub locks directly in front of the animal. Access to rations is not restricted; rations are confined to the Test-Tub and to the designated animal. To ensure ration security, Moblie Test-Tubs require proper installation, including the addition of restrictive piping at the stalls. Detailed plans and instructions are provided. Steel pipes and hardware are purchased locally. The manger piping, together with the Test-Tub's narrow U-shaped throat opening, controls the animal's feeding position. Head movement is limited, directing the animal to consume its feed over the Test-Tub, rather then drawing feed back into the stall. Spilling loss is thus eliminated. Restricting animal movement in its feeding position and high tub sidewalls combine to prohibit neighboring animals from stealing each other's feed. Nor can they exchange rations by throwing feed into adjacent tubs. Airflow within the Test-Tub prevents spoiled feed. Airflow around the Test-Tub into the stall promotes good animal health. To regulate feeding periods, withdrawal provides a practical means to control ration access. It also allows staff to dispense rations and withhold them until later feeding time. And it eases the task of feeding a group of animals their rations simultaneously. 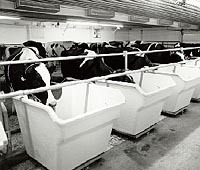 When a herd returns from the exercise yard or milking parlor, Test-Tubs are kept in withdrawal. The Test-Tub slides back into the alley and locks securely beyond the animal's reach. A retainer pipe fixed slightly above the stall curb discourages attempts to crawl out to the Test-Tub in pursuit of feed. All cows are thereby denied access to all rations until staff can verify stall assignments. Mobile Test-Tubs can be filled in the withdrawal position either by hand or machine. If alley space is limited, rations can be dispensed with Test-Tubs in feeding position. The Test-Tub detach easily from the track. Removal from the front of the stall opens unobstructed access to an animal for examination or treatment. Research personnel can handle an animal without standing in a trough or leaning over a manger. American Calan custom designs and manufactures Test-Tubs for particular experiments, animals (goats, dairy & beef cattle, swine.) or research stations. Following an assessment of your specific needs, our engineering staff prepares technical drawings, builds prototypes and conducts appropriate tests. When design and installation specifications are approved, American Calan manufactures and delivers the required number of Test-Tubs. Following an assessment of your specific need, the American Calan engineering staff prepares technical drawings, builds prototypes and conducts appropriate tests. When design and installation specifications are approved, American Calan manufactures and delivers the required number of Test-Tubs for your particular project.